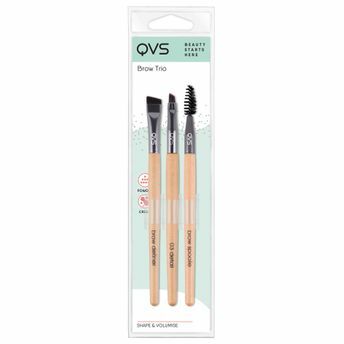 Shape, volumise and accentuate your brows to their full beauty with the super amazing Brow Trio by QVS. It is a professional quality brush set which includes all the basics you need for your daily brow make up application. These soft brushes, make the whole brow-game easy. Brow Definer Brush: Define your brow shape before filling in between the hairs to create fuller looking brows. Brow Detail Brush: Create ultra fine definition and sharp edges or use to fill in between the hairs for enhanced density. Brow Spoolie: Use to gently neaten hairs into place or use after applying brow makeup to distribute and even out the colour.